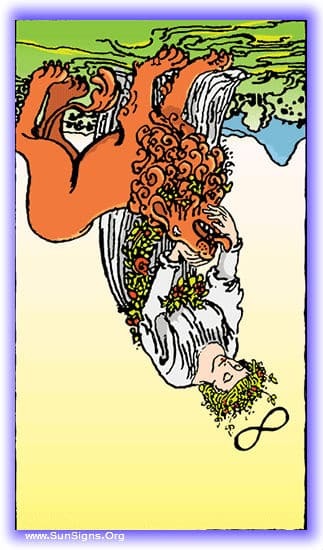 The Strength tarot card represents the two sides of its name. With this card present, you know that your life is under the influence of Strength. How it is applied becomes the most important of all aspects. In strength, our challenges become opportunities, they become stepping stones on our climb to our goals. In its reverse, all seems hopeless, and every molehill becomes a mountain. Read on more about this popular Rider Waite Major Arcana tarot card. 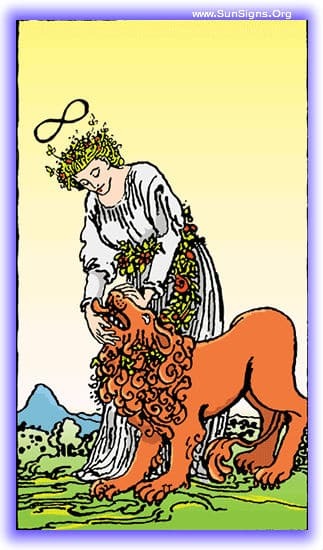 The Strength tarot card’s meaning is one of the more blatantly obvious in the Tarot. It is bearing burdens with ease, control without difficulty, anger turned to energy to solve a problem. You will find that when this card is present, your life is likely a little more handled than it has been, and you feel safe in your position in life, things are in hand. You have been standing in a position of Strength in this past period, using all your obstacles as tools. Your morale has been kept up, and you’ve had faith in yourself! Now it is time for the next step, the challenges overcome, where do you go from here? To put it simply, “You’ve got this.” Your current situation, by sheer force of will, is under control. Even your frustrations serve to fuel your fire to get the task complete, and succeed against all odds. Don’t let it go to your head, and you’ll make it through this. Your mind dwells on a future challenge, you have great concern if this situation will be beyond you. Fear not! You have the tools to succeed at this task, and if you keep your wits about you, you will come out of it successful! Strength inverted is weakness, and a clouded vision. Every small obstacle becomes seemingly insurmountable, and the anger that could have fueled your forward motion instead becomes powerless in nature. There is a futility in your actions, nothing seems possible and every way you turn is strewn with tacks to impede your progress. You’ve been feeling defeated, exhausted, and without hope in the face of the challenges you face. You need to lift your head up, as this attitude has been nothing but a barrier to you. This time is, thankfully, coming to an end, but you may find yourself back here if you don’t realign your thinking. Exhausted, defeated, and beaten down by time and opposition. Your current circumstances are not as hopeless as they seem, but they will remain that hopeless if you don’t rise to the challenge. Fuel the fires of your motivation with your frustration, your anger. Using this drive, you can power over what stands in your way and turn this path away from loss. The situation that is coming at you seems large, a mountain incapable of being challenged. Cut it down to small pieces, set up your bunker and use it to power through all that stands in your way. While you are afraid of what stands in your way, you can manage it if you meet it with confidence. Attitude is everything, time to tune up yours. Previous What Is Your Indonesian Zodiac Sign? Next What Is Your Greek Zodiac Sign?